What do songs like Let’s Stay Together, A Horse With No Name or The Candy Man mean to you? What do artists Cher, Rod Steward, The McCoys, The Byrds, America and James Taylor all have in common? Well, they are all a part of Billboard’s Number One Song List from 1956 to 1975. Former disc jockey, music and program director, and operations manager Larry Irons has taken us music lovers back down Memory Lane with Number One Songs: The First Twenty Years. He gives us a yearly list of number one songs that charted on Billboard and you will be surprised to see some of the songs that made the chart, as well as some of the one-hit wonders that made the list. In his poems, he takes the names of the songs and artists and rolls them into his poetry, providing us with funny yet useful information about that artist and song. 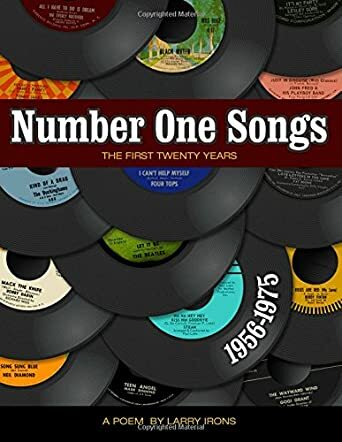 So if you love music as much as I do and want to go down Memory Lane from 1956-1975, pick up a copy of Number One Songs - The First Twenty Years by Larry Irons. You will not only be entertained and laugh, but you will learn a lot about these artists and their songs.